Glenn has more than 10 years of experience working at BirdLife Australia where he has not only overseen large citizen science projects but also engaged with local communities to establish volunteer-based monitoring programmes for Australian birds. Glenn has worked on national initiatives such as Action Plan for Australian Birds, the Climate Change Adaptation Plan for Australian Birds and State of Australia’s Birds reports. Glenn has extensive experience in the monitoring of threatened species status and analysis of monitoring data, monitoring data processing and management of threatened species. 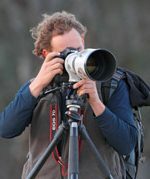 He has a significant knowledge on bird data custodians and experts on Australian birds all across the country which he has brought into the Threatened Species Index project.